Not only does it reset your body by getting your metabolism going, but it also helps you set the tone mentally for a regular eating day. Water helps you feel full, so you won’t be as tempted to carry your overeating into the next day. The water in the veggies will help hydrate you and keep you feeling full until dinner. Go for clean foods, like a piece of broiled fish with roasted veggies and a whole grain like quinoa or barley. They’ll give you the nutrients you need and you won’t be hungry.Choose lean cuts of meat and avoid oversized portions. A serving of protein should be no more than 3 ounces (85 grams) — or about the size of a deck of cards — and should take up no more than one-fourth of your plate. Vegetables and fruits should cover half your plate. Whole grains make up the rest. Try a few meatless meals each week for added health benefits. A few really tasty recipes follow to get you started. Heat an 8 or 9 inch crepe pan over medium-high heat until hot. Lightly brush the pan with some of the remaining melted butter. Pour 1/4 cup batter into the center of the pan. Quickly tilt in all directions. (Batter should lightly cover the bottom of the pan.) Cook 30 seconds. Lift edge with a spatula to check doneness. Shake and jerk the pan by its handle to loosen the crepe. Turn crepe over and cook 15 to 20 seconds. Second side will be spotty brown. Place zucchini, bell pepper, onion and tomatoes in a large baking pan. Drizzle with olive oil. Add salt, thyme and pepper. Roast 30 minutes or until tender. Spread 2 tablespoons of cream cheese on half of each crepe. Top with about 1/3 cup roasted vegetables. Fold in half, then in half again. Serve with a green salad. In a large nonreactive skillet, heat 1 tablespoon of the oil over moderately high heat. Add the onion and carrots and cook, stirring occasionally, until browned all over, about 10 minutes; transfer to a casserole dish. Add another tablespoon of oil to the skillet. Add potatoes and butternut squash, and cook, stirring occasionally, until browned all over, about 10 minutes; transfer to the roasting pan. Repeat the cooking process using another tablespoon of oil and the acorn squash and parsnips. Add the broth to the skillet and bring to a simmer over high heat, scraping up any browned bits. Pour the broth over the vegetables. Season with salt and pepper and add the marjoram. Cover and cook the vegetables in the oven for about 45 minutes, or until just tender when pierced. Increase the oven temperature to 450°F and cook, uncovered, for 5 minutes longer. Ladle into serving bowls and garnish with parsley. Serve with a slice of crusty country bread. In a colander, toss the eggplant and zucchini with 1 teaspoon of kosher salt and let stand for 20 minutes. Drain well and gently squeeze out any excess liquid. In a small bowl, stir the olive oil with the garlic. Coat a 9-by-13-inch baking dish with 1 1/2 teaspoons of the garlic-infused oil. Tear the bread into 2-inch pieces and line the bottom of the baking dish with the bread, fitting the pieces tightly together. Drizzle the bread with 2 tablespoons of the garlic oil and sprinkle the bread with half of the basil leaves. In a medium bowl, toss the eggplant and zucchini with 2 tablespoons of the garlic oil and season with salt and pepper. Sprinkle the tomato slices with salt and pepper. Arrange the eggplant, zucchini and tomatoes over the bread, overlapping them as necessary. Sprinkle with the thyme leaves and Parmesan cheese and drizzle with the remaining garlic oil. Bake the gratin for about 40 minutes, until the vegetables begin to brown and the bottom of the bread is golden brown. Remove the vegetable gratin from the oven and let stand until cooled slightly, about 10 minutes. Sprinkle with the remaining basil, cut into serving pieces. Slice off the stem end of peppers and remove and discard seeds and membranes. Submerge the peppers in a pan of boiling water and cook for 5 minutes; drain. Brown ground beef and onion in a nonstick skillet over medium heat. Drain on paper towels. Return meat mixture to the skillet. Add tomatoes, breaking them into pieces with a spoon, and cook until the liquid evaporates. Remove meat mixture from heat; stir in wild rice, Worcestershire sauce and Italian seasoning. Spoon 1/2-cup portions of the mixture into the peppers; sprinkle evenly with breadcrumbs and cheese. Place peppers in a baking dish coated with cooking spray. Bake for 20 minutes or until lightly browned. Spoon tomato sauce over peppers and return to oven until heated. Into 8 or 9 inch Quiche pan or pie plate, stir together flour, sugar and salt. Combine the oil and milk in a measuring cup and pour over the flour mixture. Mix with fork till all the flour is dampened. Press dough evenly against the bottom and sides of the pie plate. Crimp edges. Line the unpricked pastry shell with a double thickness of foil. Bake in the oven for 8 minutes. Remove the foil and bake for 4 to 5 minutes more or until the pastry is set and dry. Remove the pie plate from the oven and set aside while you prepare the filling. In a mixing bowl whip eggs with a wire whisk and stir in the broccoli, shredded Swiss cheese, milk, garlic, onion, salt and pepper; stir until blended. Pour into baked pastry crust. Place the tomato slices on top of Quiche mixture; sprinkle with Parmesan cheese. Bake for 35 to 45 minutes or until Quiche tests done in center. Protect pastry crust with foil at the end of the cooking time to prevent over browning. Cool on wire rack for 5 to 10 minutes before cutting. Eating a healthful lunch can help control blood glucose, hunger and weight. Lunch is a chance to keep you full until dinner and fit in some important food groups. Get more mileage out of your lunch by including fiber from whole grains and protein from low-fat dairy products and other lean protein sources. Studies show people who tote their meals with them weigh less, eat more healthfully and spend less money. 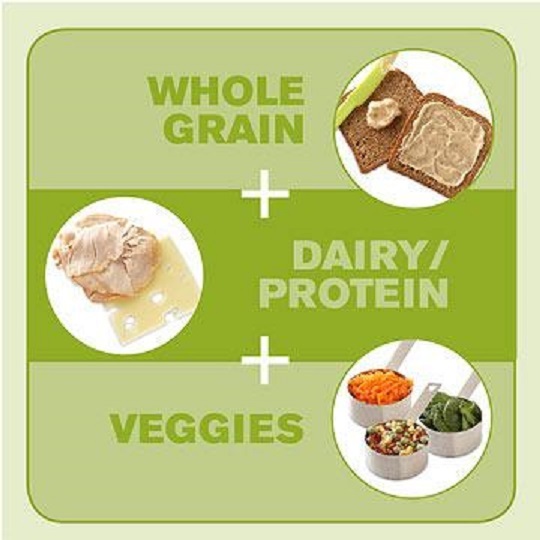 When compiling your midday meal, remember this simple formula, even at home: whole grain + dairy/protein +vegetables = healthy lunch. Include whole grains for the starch portion of your meal. You’ll get hearty satisfaction from grains with all their fiber and nutrients intact. This will be your main carbohydrate source. The dairy/protein digests more slowly than carbohydrates, helping you feel satisfied and adding staying power to your lunch. Vegetables add color, flavor and antioxidants to your meal. If you love sandwiches, use a variety of whole-grain breads, pitas and wraps. Choose lean fillings like sliced eggs, tuna fish, cheese or lean meats. Then add interest to your sandwiches with assorted greens, fresh basil, sliced cucumbers, onions, pickled peppers and tomatoes. But sandwiches are far from your only option when you’re brown-bagging it. Last night’s dinner, anything you enjoy at home can, be packed up and eaten for lunch. In fact, you might want to make extra food for dinner, so you’ll have leftovers to bring for lunch. Leftovers are the perfect food to pack and take for lunch because you can control the portions and calories in the meal to insure it will be nutritious, filling and delicious. For example, pack the leftovers from last night’s casserole into a reusable container that can be microwaved at the office. Add some carrot, celery and pepper strips for a hearty and satisfying lunch. To take this idea a bit further, try cooking in bulk. On the weekend, make a big pot of chili, chicken noodle soup or rice and beans and freeze into individual portions that are ready to take to work in a flash. Keep it cold. For safety’s sake, pack lunch with a reusable ice pack. Pasta Lover’s Lunch Salad. Make the salad with lean meat or fish, some cubed or shredded cheese (for protein), lots of vegetables to boost fiber and nutrition and use whole wheat or whole-grain pasta. Toss everything together with a vinaigrette made with extra virgin olive oil or canola oil. Pack into individual lunch containers. Mediterranean Pita Pocket. Fill a whole wheat pita with homemade or store-bought hummus, tabbouleh and sliced cooked chicken. All you need is a piece of fruit to round out the meal. Fruit and Cheese Plate. Fill a divided plastic container with assorted cubes or slices of cheese and easy-to-eat fruit, such as apple and pear slices, grapes, berries or melon. Add some whole-wheat crackers to your lunch. Everything Is Better on a Mini Bagel. Whole-wheat bagels are a wonderful foundation for sandwiches that stand up to being in a backpack or desk all morning. Start with two mini bagels. Add tuna, smoked salmon, oven baked turkey or roast beef. Top it off with cheese, fresh tomato, onion and Romaine lettuce. Two mini bagels can supply 6 grams of fiber to the meal. Enjoy Lunch Salads. A plastic container can hold the makings of a delicious salad lunch. For a Cobb salad, fill it with spinach or chopped dark green lettuce, chopped hard-boiled egg, shredded cheese, lean ham or turkey. 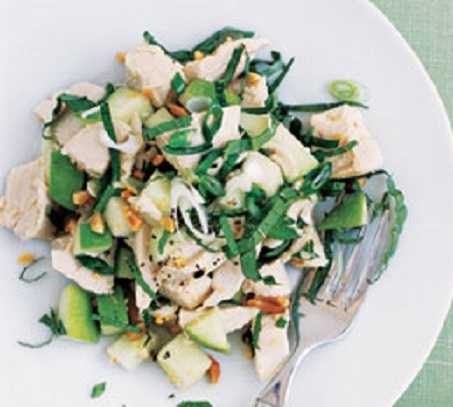 Or toss in the ingredients for a chicken salad: dark salad greens, shredded chicken, shredded carrots, sliced green onion and toasted sliced almonds. Pack the dressing separately and add it to the salad just before eating. Include more whole foods and choose lunch items with higher amounts of fiber and nutrients (like calcium, protein and vitamin C). Include fewer processed foods such as cookies, chips and snacks, which have higher sodium, added sugar and saturated fat. Heat oil in a large skillet over medium heat. Add garlic, onions and peppers. Stirring occasionally, cook until the onion starts to turn translucent, 5 to 7 minutes. In a medium bowl, combine tomatoes, paprika, oregano, cayenne and salt. Add the tomato mixture to the skillet with the onions and peppers and stir. Cover and cook for 5 minutes, stirring occasionally. Make 5 hollows in the tomato mixture and carefully crack the eggs into each hole. Cover and cook until the eggs set, 5 to 7 minutes. Serve hot with a small whole wheat roll. Heat oil in a heavy medium skillet over medium-high heat. Add onion and garlic and sauté until translucent, about 6 minutes. Add spinach and stir until spinach is dry, about 3 minutes. Let cool slightly. Place pie crust in a 9-inch Quiche dish or pie pan. Press into the pan, sealing any cracks. Crimp the edges. 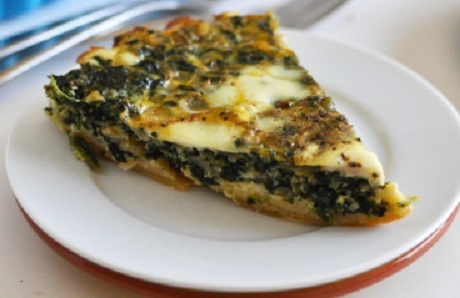 Mix flour with Parmesan cheese and sprinkle over bottom of the crust, followed by the crumbled feta cheese. Top with spinach mixture. Beat eggs, milk, salt, pepper and nutmeg in large bowl to blend. Pour over spinach. Place pie pan on a baking sheet and bake about 50 minutes or until the top is set and a knife inserted in the center comes out clean. Let cool slightly. Cut in to wedges and serve. Rinse the chicken and pat it dry with paper towels. Pound it to an even thinness between pieces of plastic wrap. Place the chicken in a large, wide saucepan and add enough water to cover by 1/2 inch. Add 1 teaspoon of salt and 1/2 teaspoon of pepper and bring to a gentle simmer. Cook until no trace of pink remains, 8 to 10 minutes. Transfer the chicken to a bowl of ice water for 5 minutes. Meanwhile, in a large bowl, combine the lime juice, vinegar and brown sugar, stirring until the sugar dissolves. Add the scallions and apples and toss. Drain the chicken and pat it dry. Dice the chicken and add it to the apple mixture along with the peanuts, basil and remaining salt and pepper. Toss and divide among individual plates. Taking a healthy lunch to work is one of the simplest ways to trim your budget. Most people think nothing of spending $10 or so for a restaurant lunch, but over the course of a month — or a year — the expense can really add up. Beyond the cost savings, most meals packed at home are healthier than foods from restaurants or fast food counters. 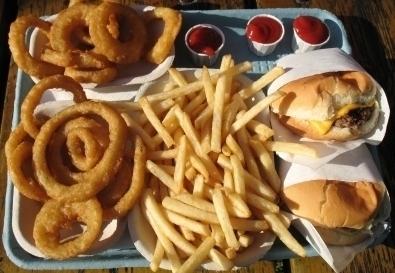 When we eat out, we’re often faced with huge portions and fattening extras — like the french fries that routinely come with sandwiches. But when you pack lunch at home, you can control your portions and choose healthier ingredients. Break up the tuna in a mixing bowl and mix in the parsley, lemon, oil, tomatoes, olives, salt and pepper. 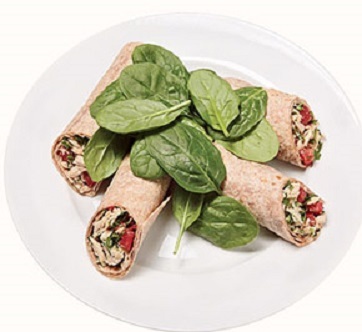 Divide the mixture between the wraps, top with spinach leaves and roll up. Wrap the sandwiches tightly in plastic wrap and refrigerate. 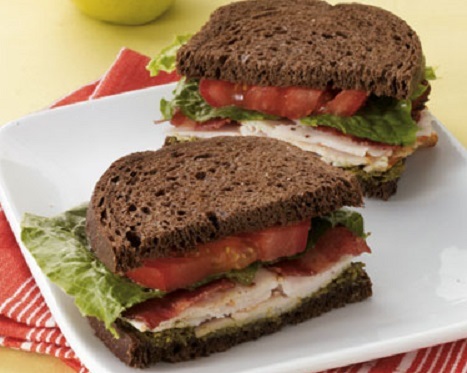 If you would like a little crunch in your sandwich, add a slice of cooked turkey bacon. Spread pesto on the bread. Top 1 bread slice with turkey, lettuce, tomato and top with the remaining bread slice. Place in a large plastic sandwich bag. Make ahead salad to pack for lunch. 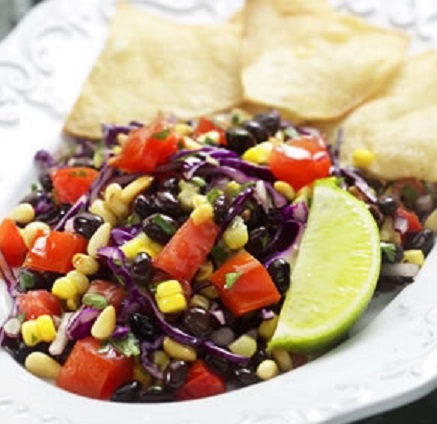 Serve with healthy toasted corn tortillas. Whisk lime juice, oil, salt and pepper in a large bowl. Add the corn, beans, cabbage, tomato, mango, parsley and onion; toss to coat. Sprinkle nuts on top. Refrigerate in lunch containers with a lime wedge. The few Italians who came to Texas during the seventeenth, eighteenth and early nineteenth centuries were mainly explorers, adventurers or missionaries. The Italian presence in the state goes back to the earliest years of Spanish exploration. Like Christopher Columbus, Italians were often in the employ of the Spanish during that early period of discovery. Some soldiers of fortune came from northern Italy, but the larger numbers were from Sicily and Naples, provinces that were under the Spanish crown at various times. Francisco Vásquez de Coronado’s explorations in 1541 included soldiers with the Italian surnames of Loro, Napolitano and Romano, among others. When Texas became a settled territory in the late 1700’s, individual Italian merchants began to arrive. Among them was Vincente Micheli who came to Nacogdoches from Brescia. Prospero Bernardi, an Italian immigrant who took part in the Battle of San Jacinto, where he was wounded on April 21, 1836. 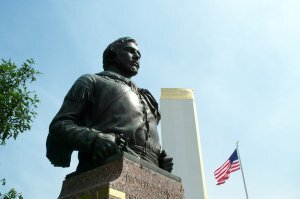 In 1836, when Texas won independence from Mexico, Italian-born Prospero Bernardi was one of the Texans who fought at the Battle of San Jacinto. The older cities of San Antonio, Nacogdoches and Victoria have Italian families who date back to this period. Not until the 1880’s, however, did Italian immigrants begin to arrive in Texas in large groups. Between 1880 and 1920, immigration to Texas increased from a trickle to a flood. In 1870 there were 186 Italian residents in Texas. By 1920 their numbers had swelled to 8,024. The immigrants’ primary goal was to provide a higher standard of living for themselves and their families. The Italian immigrants were drawn by railroad and steamship advertisements, notices published in the Italian-language press, letters from Italian immigrants already in America and word-of-mouth information. Italian Texans learned to grow cotton and corn on Texas soil, to speak the English language and to adapt to their new environment. They purchased land, opened businesses and acquired a degree of geographic mobility. These were mostly farmers who settled in three areas: the Brazos Valley around Bryan, mainland Galveston County and Montague County in the Red River Valley. The Montague group was from northern Italy. Never large in number, they engaged in agriculture, including planting some vineyards, primarily to supply the family table, but a few small wineries operated until Prohibition. Over in southwest Texas, Frank Qualia, who came from northern Italy to Del Rio, established Texas’ oldest winery in 1883. The Val Verde Winery managed to survive Prohibition by selling table grapes from the Qualia family vineyards. A fourth group has largely “come and gone.” These Italians were the thousands of miners and brick makers of Thurber. Between 1880 and 1920, this coal-mining town grew to a population of 10,000. Now, it is a virtual ghost town, a mere exit sign on Interstate 20, west of Fort Worth. Most of the Italians of Thurber moved to other areas when the mines and factories closed. 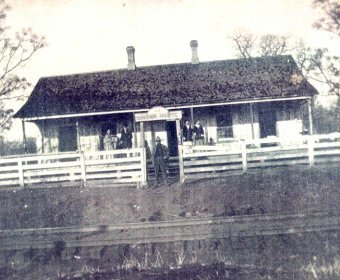 Another group of Italians worked building a railroad in 1881 that extended from Richmond and Rosenberg to Brownsville. So many Italians were employed that the rail line became known as the “Macaroni Line.” Financial problems halted construction at Victoria in 1882 but many of the workers stayed in the area and settled in Victoria, Houston, San Antonio and Galveston. The Brazos Valley Italians came from impoverished Sicily, specifically from three villages, Poggioreale, Corleone and Salaparuta. After a period of tenant farming cotton and corn, they began to acquire land, some of it being flood-prone bottom land that had been passed over by previous immigrants. Estimates in the late 1800’s on the numbers of Italians along the Brazos ranged from 2,400 to 3,000. In 1899, heavy rainfall caused severe flooding in the Brazos bottom and some of the Italian families left the area for mainland Galveston County, where other Italians had begun to establish vegetable and fruit farms.There another weather disaster, the Galveston hurricane of 1900, created havoc for these Italian-Texans, damaging their farmland with the surging saltwater tide. (In the first week of December in 1913, major flooding occured in the state of Texas. According to the official records, the Brazos crested at 42 feet at Highbank. In September of 1936, another flood hit Highbank but this time the river crested at 40 feet). However, the families stood fast, continuing their farming or finding employment in nearby Houston. Today, the Galveston County towns of League City and Dickinson retain their Italian heritage. The pillars of Italian cultural identity in Texas have been principally food, faith and family. First is membership in the Roman Catholic Church. This can be seen in “Italian” parishes today, such as St. Anthony’s in Bryan, Shrine of the True Cross in Dickinson, St. Francesco Di Paola in San Antonio and others. Also, the tradition of the St. Joseph Altar on the feast day, March 19, remains a custom in several Texas cities. On this day in Sicily, dishes of pasta, cakes and breads were placed on a specially decorated table in the church to symbolize food to the poor. Second, knowledge of the preparation of Italian cuisine and the customs that go along with the celebration of the meal – such as folk music and dance – are other important factors in maintaining Italian identity. One distinguishing dance is the tarantella, almost always part of the wedding feast. Social historians describe the Sicilian tarantella as “full of movement and abandon,” a dance that centuries ago fused with the Spanish fandango, performed in the Italian style without castanets and played with a certain melody. At times the sole accompaniment is the rhythmic clapping of hands. Third, the foods and folk customs are almost always shared with the family. Italian consciousness does not depend on any one of these attributes, but a sum of all of them all. It is manifested in a pride in Italian achievements, especially, in architecture and sculpture. Courthouses designed by immigrated Italian architects grace many Texas county seats. Other public spaces are anchored with sculptures by Italian-Texans. Among such artists is Pompeo Coppini, who was born in Tuscany in 1870 and arrived in Austin in 1901. His sculptures include the Littlefield Fountain at the University of Texas in Austin, the statue of Gov. Sul Ross on the campus of Texas A&M University and the Alamo Cenotaph Memorial in San Antonio, the city he made his home and where he was buried in 1957. 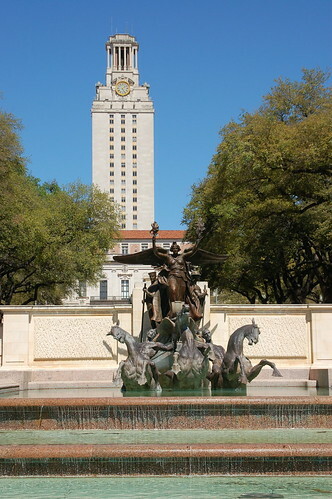 Littlefield Fountain at the University of Texas in Austin by Pompeo Coppini. Oscar and Frederick Ruffini, two Genoese brothers, designed many Texas public buildings. Frederick (b.1851) arrived in Austin in 1877. He was the architect of 19th century courthouses in Henderson, Longview, Georgetown and Corsicana. Oscar (b.1858) settled in San Angelo and was the architect for several West Texas courthouses including those in Concho, Mills, Sutton, Sterling and Crockett counties. Other Italian artists in Texas include: John C. Filippone, print maker for George Roe’s version of The Rubaiyat of Omar Khayyam; Rodolfo Guzzardi, painter of landscapes, including “Palo Duro Canyon-Texas”; sculptor Louis Amateis and Enrico Cerrachio, creator of the Sam Houston monument in Houston’s Hermann Park. Parks, airports, streets and communities bear the names of prominent Italian immigrants, among them Bruni Park in Laredo, named for Antonio Mateo Bruni and Varisco Airport in Bryan, named for Biagio Varisco. The Italians in Texas constitute the sixth largest ethnic group in the state, according to figures from the U.S. census of 1990. In that year, when the total population of Texas was 16.9 million, the number of Texans who said they were Italian or part-Italian was 441,256. Sources: Texas Almanac and The Italian Experience in Texas, by Valentine J. Belfiglio, Eakin Press, Austin, 1983. Photo taken in Poggioreale, Sicily in the mid 1990’s. “In the 1870’s and 1880’s, a wave of immigrants from Sicily boosted the population of the Highbank settlement to over 300. These early settlers travelled by wagons, stage coach, by horseback and Model T Ford from the Ports of New Orleans and Galveston to the banks of the Brazos River. Many of the Highbank settlers came from Poggioreale, Sicily and from surrounding villages and towns. Poggioreale was the former home of many of Highbank’s settlers, including the Falsone, Guida, & the Falco families. Other settlers came from small towns in an around Poggioreale like Alcomo and Palermo.” According to Mary Lena (Salvato) Hall, “My grandfather, Carlo Salvato passed away on November 22, 1949 at the age of 82. He was born in Italy on November 2, 1867. He came to the United States with his brother Frank Salvato. The two families purchased the Rogers farm that set up the beginning of the Italian farming community in High Bank. He is buried in Marlin, TX. He had five sons, Tony Salvato, Frank Salvato, Ross Salvato, Nick Salvato and Carlo Salvato and all are buried in Marlin except Tony Salvato who is buried in Houston. Four daughters Lula Lewis, Pauline Vetrano, Fena Rao and Mary LaPagelia all deceased and buried in Houston. They originally came through Louisiana.” “Our old house consisted of three bedrooms: a combination dining room and living room and a small kitchen (ten feet wide and fifteen feet long). The kitchen was located next to the bedroom, which was no bigger than today’s modern walk in closet. Linen were stored in metal trunks. Sunday clothes worn to church were hung in a cloth cabinet called chiffonier.” “The Italian influence can still be seen with Italian surnames appearing on most of the area mailboxes!. Prominent Italian families in the Highbank area once included the Salvato family, Alfano family, the Barbera and LaBarbera families, the Burresha family, the Cangelosi family, the Catalano family, the Corpora family, the Falco family, the Falsone family, the Margoitta family, the Martino family, the Parrino family, the Salvaggio family and others.” The following description of early Highbank comes to us from Robert Falsone who was born in Highbank in 1911 and lived there with his family that included ten children. Robert Falsone has taken the time to share many of his early memories of Highbank that provide a facinating account of life in the early days in Highbank! “My name is Robert Falsone and I was born in Highbank on July 24, 1911. The following are my recollections of our early life in Highbank. When I was thirteen years old, daddy hired someone to paint door frames of the house. When the painter was out for lunch, I took the bucket of paint and the brush, went behind the car garage and printed R F 13 years old. Everytime I would go behind the garage , I would look up to see 13 still on the wall. It seemed like I never would get to be 14”. “The old house was a single wall frame house with one window in each room. A netting was tacked on the walls from the ceiling to the floor. Mother, with the help of the neighbors, papered the walls. The paste for sticking the paper to the wall was made what looked like flour mixed with warm water and brushed on the back side of the colorful paper. While the paste was still wet it stuck firmly on the netting tacked on the walls. In the winter when the North wind blew strong, the wall paper would push out and the go back against the wall. It appeared the wall was breathing. In the flood of 1913, water stood four feet deep in the house. It seems that when the house was built, the builders forgot to put an opening in the ceiling to get in the attic. As the water began to enter the house, daddy took an ax to cut a hole big enough for us to get up in the attic. I was only two years old when the flood took place, but mother explained to me years later why there was still a hole in the ceiling”. “My father, Dominico Parrino, was the first farmer to buy a tractor and everybody told him he could not plow a good field with the plow and big tires on the tractor, but he did well. So the next year, many of the other farmers bought tractors and are still plowing the fields that way! Course now they have even better tractors. We all had gas pumps on the land for fueling the tractors. The gas was Mobile Gas and we had the Red horse with wings on the pumps. I remember that each winter, Dad would kill a hog on a cold day (we had no refrigeration) and we made a lot of Italian sausage and hams, which my dad smoked in a barrel and then stored them in coolers in Marlin”. “Many of the first Sicilians to arrive in Texas took jobs as farm laborers because this was what they were most familiar doing. Soon, enterprising immigrants began selling their produce in the markets and as they acquired capital, they opened small corner grocery stores. According to the Houston City Directory for 1907, 13% of all grocery stores in Houston were owned by individuals with Italian surnames. Damian Mandola’s grandfather, Vincent, and his great uncles, Frank and Giuseppe, were among those who opened such stores. Vincent’s was located in Houston’s near east side and stocked canned goods, fresh fruits and vegetables and household supplies. But, as was common for many Italian grocery store owners, Vincent also sold Italian cheeses and deli meats, such as prosciutto, salami and pancetta. For the Italian immigrants who came to America in the early 1900s, food and cooking were (and remain for their descendants) essential components of social life. The immigrants who came to Houston maintained their culinary traditions, just as they did in such places as New York or Boston. However, the effect Italian immigrants had on Houston’s culinary landscape was more diffuse than in northeastern cities. Houston has never had a Little Italy, but scattered in neighborhoods throughout the city, Houston’s Italian groceries fostered the growth of small food empires. Damian recalls one man who parlayed his corner grocery into a pasta factory; another went door-to-door selling olive oil and cheeses. His own father started a meat packing business, which ultimately failed after an untimely accident.” “There was always a stove in the back of all the stores where the women would cook,” muses Frankie B., who recalls making Italian sausage in the back of his parents’ store. “Our grandmothers would cook these huge Sunday meals for 50 or 60 people; our friends couldn’t believe it.” It was only natural for some of the sons and daughters of grocery store owners to start serving the recipes of their parents in a cafe setting. Directions: Carefully slice the loaf in half . Scoop out the insides (top and bottom) to make a large cavity for the filling. Begin layering and alternating the meats, cheese and condiments. It helps to lay everything out assembly line style and layer in order, making sure to get everything evenly distributed. Use all the meat and cheese. You’ll likely have extra condiments (these can be served on the side if you like). Once the loaf has been filled, put the top back on and wrap it tightly in plastic wrap. Put a heavy pan over the top to weigh it down and chill the sandwich for at least 4 hours to let the flavors come together. Unwrap, slice in wedges and drizzle with balsamic vinegar. Directions: Preheat oven to 425 degrees F. In a large skillet over medium heat, saute onion, eggplant, zucchini, bell pepper and garlic in oil for about 10 minutes. Turn off heat and fold in artichoke hearts. In a bowl, whisk egg, egg whites, milk, black pepper, thyme and oregano. Add egg mixture, basil and mozzarella to vegetable mixture. Gently stir until eggs and mozzarella are evenly distributed. Coat an 8″ square pan with cooking spray. Pour in quiche mixture. Place in the oven for 25-30 minutes or until a tester comes out clean. Remove from the oven and let sit for 10 minutes to set. Directions: Roast whole sweet potatoes drizzled with olive oil. Remove from the oven and allow to cool for 10-15 mins. Remove all the skin from the sweet potatoes. Place the peeled sweet potatoes in a food processor and mix to a rough texture. Add the flour, brown sugar, parmesan cheese and the eggs and continue to process until smooth. It should look and feel like a pizza dough; very elastic. Lightly dust flour over a wood countertop/cutting board. Separate the dough into five equal balls and begin rolling each ball out into a long thin string about 2 inches in thickness. Once all the dough balls have been rolled out, use a dough scraper/cutter to cut all five strings at once into 2 inch by 2 inch gnocchi. Lightly dust the cut gnocchi with flour and roll each gnocchi with a dinner fork to give them the traditional design. Heat a saute pan to medium high heat. Add 4 tablespoons of olive oil. Once hot add the chopped green onions and saute for 2 minutes. Add the jumbo shrimp and cook until pink. Add the chopped parsley and toss. In a separate saute pan; heat 4 tablespoons of butter. As the butter begins to foam around the edges add the gnocchi and sage. Toss and top with the shrimp. Directions: Bring water, butter and salt to a boil. When boiling add flour and stir until thoroughly mixed, for about 1 minute. Remove from the heat and put into electric mixing bowl and cool for 10 minutes. Mixing at a low speed add 1 egg at a time allowing each egg to be absorbed. Put dough into a pastry bag. Cut 12 pieces of wax paper into 3-inch squares and lightly dust with flour. Pipe a doughnut shape onto each piece of paper. Heat oil to 350ºF in a deep pan. Carefully slide batter off the wax paper into the oil. Fry for 7 to 8 minutes turning every couple of minutes. Doughnuts should double in size. Allow to cool on absorbent paper. Slice horizontally. Mix ricotta, sugar and vanilla extract in another mixing bowl on medium speed for 2 minutes. Add chocolate chips and mix for 10 seconds. Put cream in pastry bag and fill center of each zeppole. Sprinkle with powdered sugar and place a cherry on top of each pastry. To make the shells, sift the flour, sugar,and salt together into a large mixing bowl. With a pastry blender or two knives, cut in shortening until mixture resembles coarse crumbs. With a fork or your hands, mix in the milk. Continue mixing until you have a soft dough. Cut the dough in half. Roll out each half on a floured work surface to a thickness of 1/8-inch. Using a 3-1/2-inch biscuit or cookie cutter, cut out circles of dough. Heat the oil to a depth of 4 inches in a deep saucepan or deep fryer until it registers 325°F on a candy thermometer. Wrap each dough circle around a metal cannoli tube, sealing overlapping dough with the beaten egg white. Fry in the hot oil until golden brown (about 4 minutes). Remove carefully and place on paper towels to drain and cool. To assemble: Fit a pastry bag with the largest tube or snip 1/2-inch off the corner of a resealable plastic bag. Pressing one finger over the tube opening or pinching the corner of the bag shut, spoon filling into the bag. Fill each cannoli tube with the filling. Cover and refrigerate up to 1 hour or until ready to serve. Makes about 30 cannoli.